Obituary for Marguerite M (Barrieau) Vautour | Boucher Funeral Home, Inc.
Marguerite M. (Barrieau) Vautour, 92, of Winchendon, formerly of Gardner, died peacefully Tuesday, November 27, 2018 in Broadview Assisted Living of Winchendon. Marguerite was born in Acadieville, N.B. Canada on December 12, 1925, the daughter of the late Hubert and Delina (Barrieau) Barrieau. She was employed by the Templeton Developmental Center as a direct care worker for many years, retiring in 1986. Marguerite was a member of Annunciation Parish/Our Lady of the Holy Rosary Church of Gardner. She enjoyed traveling, cooking, and crocheting; and she especially loved spending time with her family. 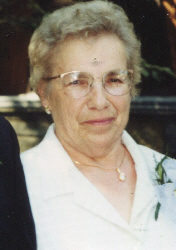 She was predeceased by her husband of 63 years, Francois J. Vautour who died in 2011. Marguerite leaves her sons, Ivan J. Vautour of Gardner, George J. Vautour of Manteca, CA and Alphonse J. Vautour of Baldwinville; daughters, Ginette Vautour of Baldwinville, Odette of Ashburnham and Simone Cutler and her husband Stanley of Saco, Maine; ten grandchildren; nineteen great-grandchildren; several nieces, nephews and cousins. She was predeceased by her daughter, Delima Carney; brothers, Basile, Alyre, Joseph, Adolph and Francois Barrieau; and sister, Virginie Richard. Funeral Services will be held Saturday, December 1st from the Boucher Funeral Home, Inc., 110 Nichols Street, Gardner with a Mass at 12:00 p.m. in Annunciation Parish/Our Lady of the Holy Rosary Church, 135 Nichols Street, Gardner. Burial will be in Notre Dame Cemetery, West Street, Gardner. Calling hours will be held Saturday, December 1st from 9:30 a.m. to 11:30 a.m. in the funeral home. Memorial contributions may be made to Annunciation Parish/Our Lady of the Holy Rosary Church, 135 Nichols Street, Gardner or to the Alzheimer’s Association, 309 Waverley Oaks Road, Waltham, MA 02452. Please reference in memory of Marguerite Vautour. Marguerite’s family would like to thank the staff of Broadview Assisted Living for their kind and compassionate care.